Feline eosinophilic granuloma complex is a term that describes a group of three different skin lesions that occur on cats. It is thought that these skin lesions are caused by a hypersensitive reaction to an irritant, such as a flea bite or an allergic reaction. If your cat begins to have lesions or ulcers on its body, you should have it looked at by a veterinarian. A veterinarian should be able to give you a diagnosis and treatment plan that will eliminate, or at least minimize, the lesions. If you discover that your cat has lesions on its body, you should get them checked out by a veterinarian. However, this is typically not a life-threatening emergency, so it’s appropriate to make an appointment to bring your cat in. Call your veterinary office, describe your cat’s symptoms to the veterinary staff, and then make an appointment for your cat to be seen within a day or two. Lesions are typically raised areas that are red and covered in bumps, which could be described as ulcers or abscesses. They can also be oozing, yellowish or tumor-like. Once you describe your cat’s symptoms to the veterinary staff, they may tell you to bring your cat in right away. If this is the case, follow their directions and get your cat veterinary treatment immediately. Once your veterinarian assesses your cat’s health, they will do tests to figure out what is causing your cat’s lesions. These tests usually include a fine needle aspiration or tissue biopsy in order to look at the cells in the lesions. Once they are sure that your cat has feline eosinophilic granuloma, they will then begin planning the cat’s treatment. The vet will be able to differentiate between the types of feline eosinophilic granuloma by looking at the lesions. Eosinophilic plaque lesions are typically on a cat’s medial thigh and abdominal regions. Eosinophilic granuloma lesions are typically on a cat’s upper thighs or oral cavity. Eosinophilic ulcers are typically located on the cat’s upper lip. Thigh or abdomen sores typically look like red, angry hives, while lip sores may be more pustulent. 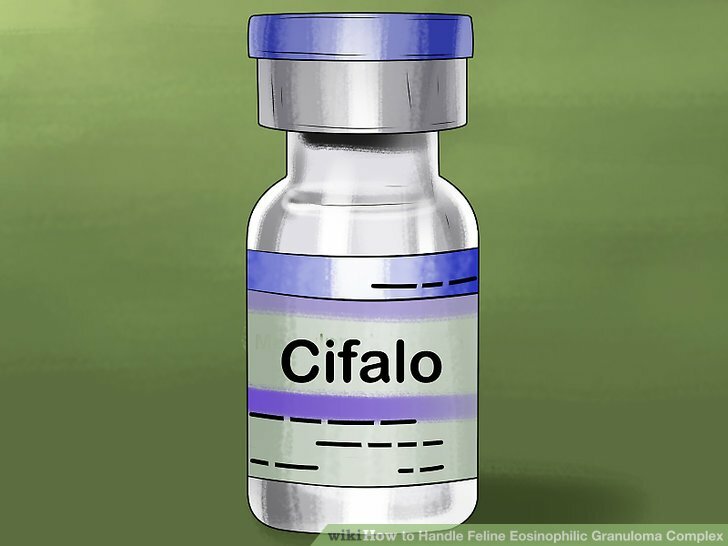 Corticosteroids are used for treating feline eosinophilic granuloma because they reduce inflammation and reduce the body’s immune response, which in the case of feline eosinophilic granuloma is over sensitive. However, they can cause side effects in cats, so their long-term use needs to be monitored closely by a veterinarian. Some common corticosteroids that may be prescribed to your cat include methylprednisolone acetate, oral prednisolone, or oral triamcinolone. In many cases, feline eosinophilic granuloma infections can be reduced with the use of antibiotics, in addition to corticosteroids. This type of medication can clear up any underlying infection that occurs due to open sores or additional infection. The specific antibiotics often given to help with this infection include amoxicillin-clavulanate, cephalosporins, and fluoroquinolones. Consider surgical or cryosurgical treatment. In some cases of feline eosinophilic granuloma, your veterinarian may suggest surgical or cryosurgical removal of your cat’s lesions. With cryosurgery, lesions are frozen with liquid nitrogen and then removed. This is typically only done as a last resort, if lesions cannot be managed in other ways or return repeatedly. 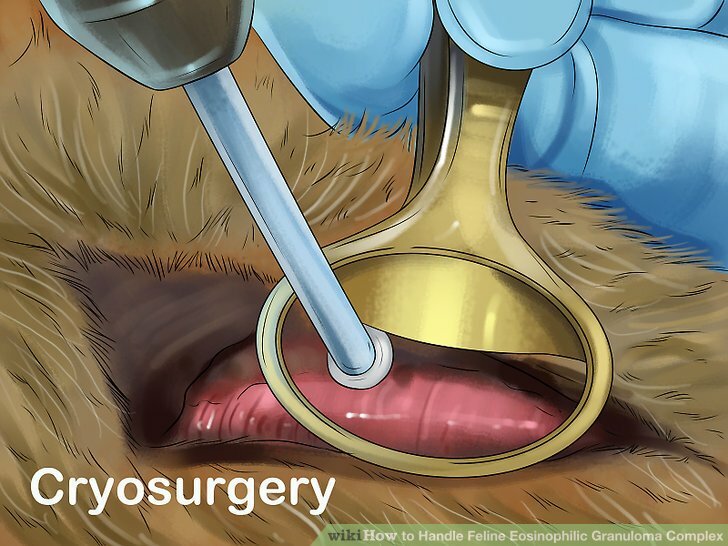 Surgery and cryosurgery usually require the cat to be anesthetized. Be aware of the health risks associated with anesthesia, learn about how to help your cat recover from anesthesia, and make sure that your veterinarian is sure that your cat is healthy enough to be put under. Some alternatives to surgery exist, such as topical medications and treatment with the amino acid lysine. Talk to your veterinarian to determine which treatment is most appropriate for your cat. 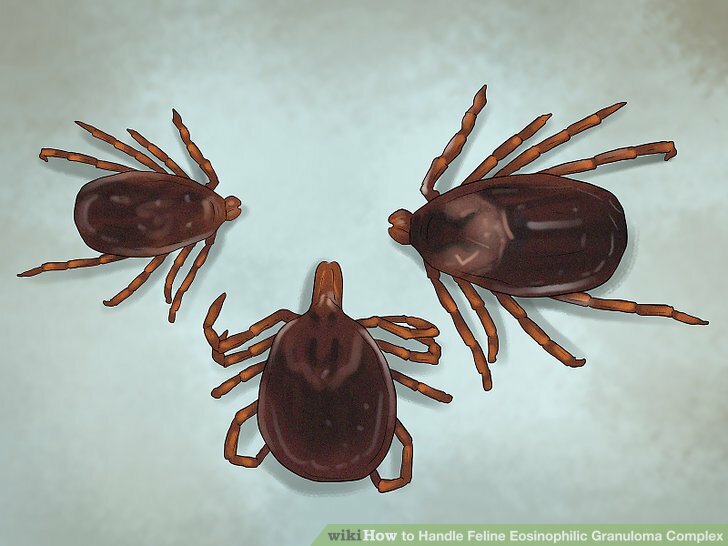 It is important to keep fleas and other parasites under control when treating feline eosinophilic granuloma. 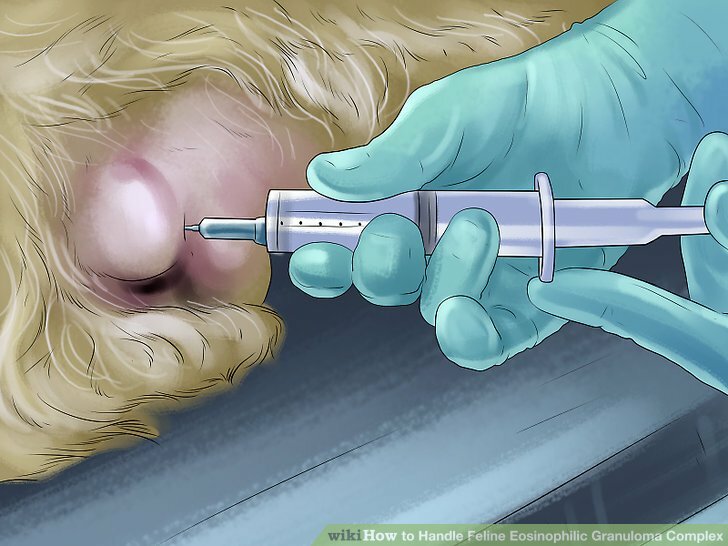 Bites from parasites can cause the immune system of a cat with feline eosinophilic granuloma to overreact and that can begin an outbreak. If you are already giving your cat parasitic treatment on a regular basis, make sure that it is working well for your cat by checking for parasites and then continue treatment as normal. Try an elimination or hypoallergenic diet. If you, or your veterinarian, think that the lesions could be related to a food allergy, you may want to start an elimination diet or start feeding your cat a hypoallergenic diet. Finding the source of the allergic reaction that prompts the lesions, and then keeping it out of your cat’s diet, can go a long way toward clearing up the condition. An elimination diet requires that you transition your cat onto a diet that does not contain likely allergens. 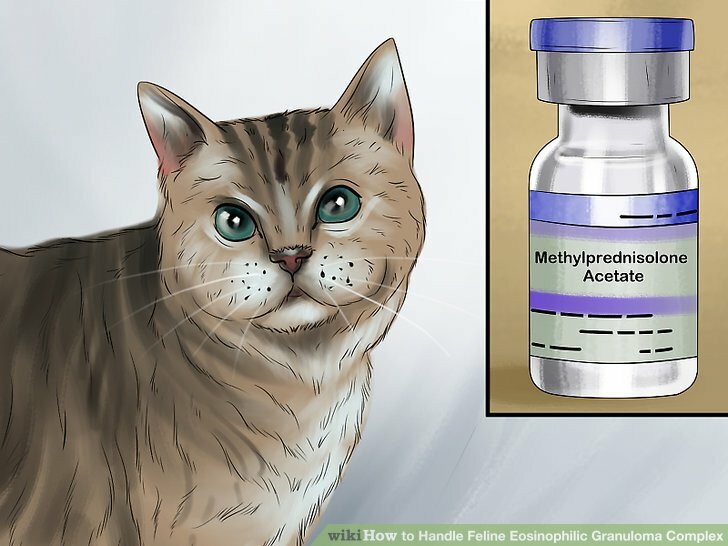 Then, once your cat’s symptoms decrease, you start introducing possible allergens back into the cat’s diet, in order to figure out what exactly was causing the lesions. These diets typically consist of novel proteins, such as kangaroo and duck, as well as a carbohydrate source. 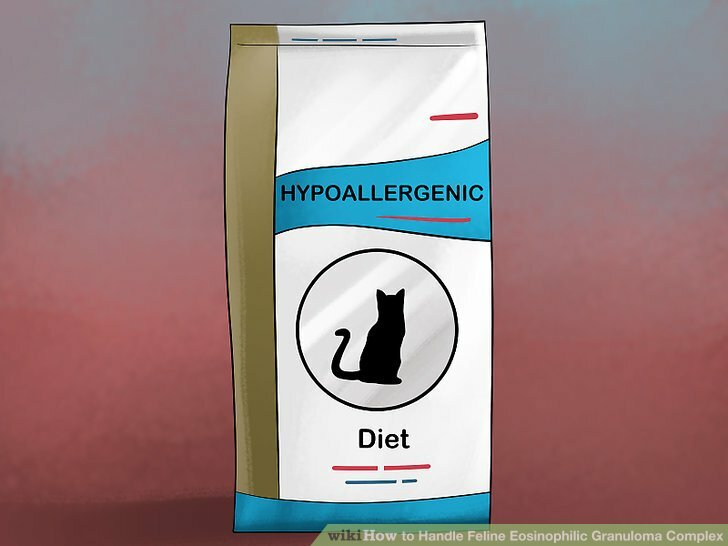 A hypoallergenic diet is a type of cat food that doesn’t contain any ingredients that are likely to cause an allergic reaction in cats. Begin treatment again when flareups occur. While symptoms of feline eosinophilic granuloma can be treated, it can be difficult to eliminate all flareups. In many cases, your cat will need treatment on and off for the rest of its life. If your cat’s lesions return after a long period without flare ups, you should have it seen by a veterinarian. 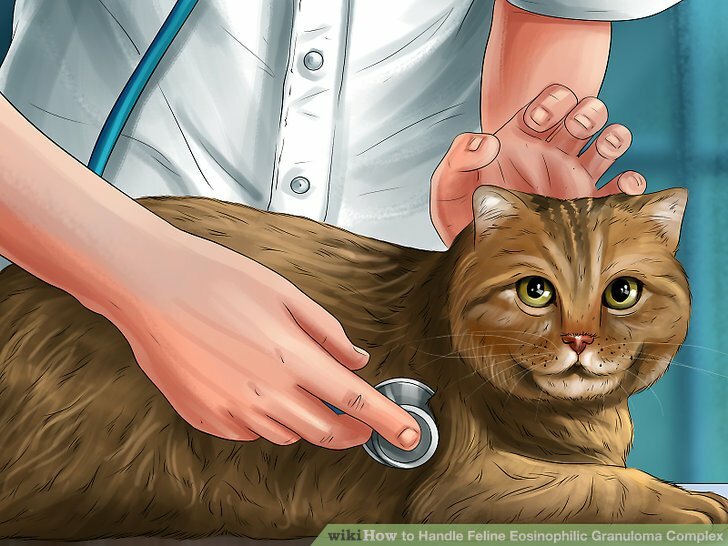 This will allow the veterinarian to make sure that your cat doesn’t have any new underlying conditions that are causing the flare up. Look for lesions on the cat’s upper lip. 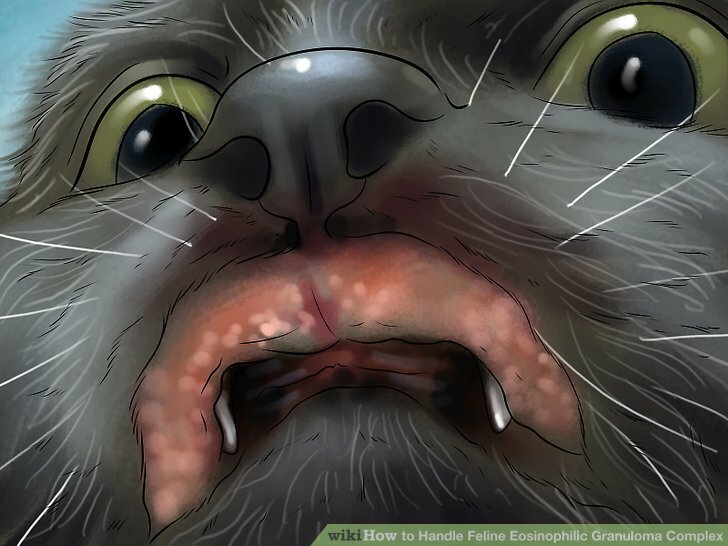 Lesions on a cat’s upper lip are symptomatic of an eosinophilic ulcer, one of the types of feline eosinophilic granuloma lesions. These lesions are typically not painful or itchy and they are very small in size. There are a variety of causes of lesions on cats, so you should have them looked at by a veterinarian to figure out the exact cause and correct treatment. Assess the cat for lesions on the inner thigh and abdominal regions. Lesions on the medial thigh and abdominal regions are symptomatic of eosinophilic plaque, one of the types of feline eosinophilic granuloma lesions. These lesions tend to be very itchy and so you will probably notice your cat itching these areas more than normal. Look for lesions on the upper thighs and in the oral cavity of the cat. 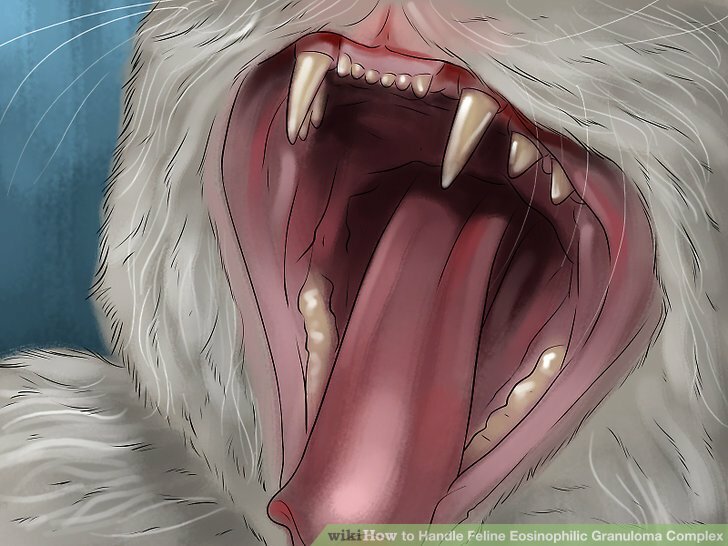 Lesions on the upper thighs or in the cat’s mouth are symptomatic of eosinophilic granuloma lesions. 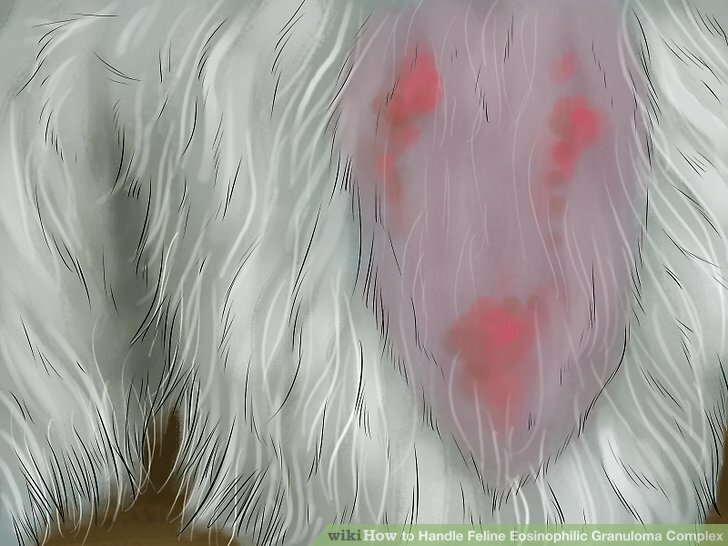 However, these lesions can occur anywhere on the body, including the head, face, bridge of the nose, pinnate, or pads of the feet, so in most cases it requires a veterinarian to diagnose this condition specifically. These tend to be yellowish to pink colored lesions.